With the growing popularity of period pieces, there has been a corresponding rise in the manufacture of reproductions. As buyers become more willing to pay a premium for these pieces, the design and execution of reproductions is getting more sophisticated and sometimes indistinguishable to all but the most experienced jewellery experts. Unwary dealers of estate and antique jewellery have often paid dearly for mistaking a reproduction for an authentic period piece. Even among experts, there is often disagreement about the authenticity of some pieces. Identifying various characteristics can aid in determining the origin of a piece. My approach is similar to that of a detective; it’s a matter of observing all the clues and then weighing the evidence in light of past experience. For this reason, expertise in this field is a matter of judgment, subject to the clues at hand. This can be illustrated by my assessment of four individual examples of period pieces that were brought in to our office for evaluation and sale by private clients. The characteristics of these pieces are typical identifying factors of their authenticity. 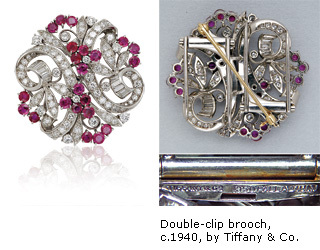 The first piece is a diamond and ruby double-clip by Tiffany & Co., circa 1940, designed as diamond leaves and ruby berries amid round and baguette diamond scrolled ribbons. The rubies are all Burmese and well matched for color, clarity, size and cut. The diamonds are FG colour and the clarity is VS to WS. 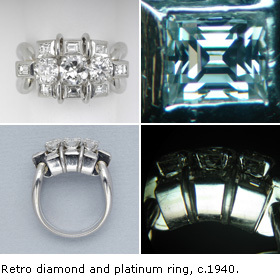 The cutting style of round diamonds evolved from when the modern diamond saw was invented and generally used in the early 1920s until 1940 when the back facets became narrow as we see in diamonds today. The diamonds in this piece have back facets that are consistent with those cut in the late 1930s. The design is typical of the floral sprays popular from 1940 until 1960. The double clip components on the back of the piece typically fold over a removable part that incorporates a pin. Such double-clip designs are meant to be worn either together or separately. The concept was popular during the 1920s and persisted into the 1940s. Although the settings were made of platinum to ensure strength even where there is fine detail, the clips and joiner at the back were made of white gold due to its properties of rigidity. Platinum was considered too malleable to use as pins. White gold is much more springy. This piece is signed “Tiffany & Co.” on both clips. During the Second World War, platinum became scare, and avant-garde jewellers started experimenting with alternatives. This particular example utilized 950 palladium. 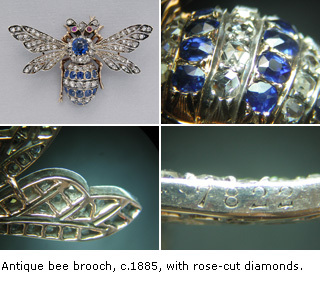 This antique bee brooch, circa 1885, is accented with rose-cut diamonds, round sapphires and ruby eyes. As with most pieces of this period, there is more silver than gold. The gold formed a thick layer at the back, and this was fused to the upper silver settings. The very small table facets of the colored stones mimick the shape of those in old mine-cut diamonds. Unfortunately, some of the leg parts have broken off over time, but this could be restored. The piece contains rose-cut diamonds throughout, a sure sign of authenticity, as almost no one cuts diamonds this way today. It was also common for pieces of this period to contain old mine cuts as well. Another clue in authenticating this piece is to examine the patina on the metal at the sides and back. In this case, the randomness indicates a normal aging process. Uniformity would have indicated a reproduction, with a patina and even a tarnish that has been artificially induced. This elaborate, Art-Deco flower basket brooch by Ellis Bros., circa 1935, features a carved sapphire bird and two carved emerald leaves, decorated with rubies, sapphires and diamonds, accented by a stripe of black enamel and a piece of U-shaped rock-crystal. While Cartier popularized the use of multiple carved rubies, sapphires and emeralds in the Art Deco period, other jewellers occasionally adapted the style. This piece is the work of a French jeweller, as evidenced by the French assay marks (an eagle head for platinum and a doghead for 18k gold). Testing confirms the entire setting is composed of platinum, while only the pin is made of 18k white gold. 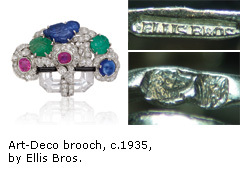 The signature is that of Ellis Brothers, one of the top jewellers in Toronto during the 1920s. The bold design of this Retro diamond and platinum ring, circa 1940, is typical of the period from 1935 to 1950. The workmanship is superb, with many parts built separately and then masterfully fused together. Interestingly, the back facets of the three central diamonds indicate the possibility they were cut in three separate decades: 1920, 1930 and 1940. The small, Asscher-cut diamonds surrounding them are named after the inventors, the Asscher Brothers of Holland. Invented in 1902, it was a modification of the popular cushion cut of the previous century, with its small table, open culet, high crown and deep pavilion. This style of cut evolved into the elegant emerald cut, which became popular during the Art-Deco period.